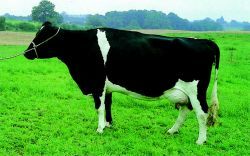 Holsteins Friesian are easy to identify with their separate marking colors and higher production of milk. As an indication of the genetic merit of the cows remaining in the dataset, the Australian Profit Ranking (APR; the profitability of production and non-production traits relative to the average APR of the Australian dairy herd) was determined for those cows enrolled in herd testing (121 Holstein Friesian and 21 Illawarra cows). De acordo com os coeficientes angulares, a queda diaria da producao foi quatro vezes menor nas ovelhas East Friesian (2 vs. Breeding records on 150 Friesian x Sanga crossbred cattle from the ARI Katamanso station were used. As the Holstein Friesian is a lowland breed of North Western Europe, the present study was planned to investigate the effects of various environmental factors on milk and milk fat yields of this breed reared at high altitude (about 1950 m above sea level) conditions of Eastern part of Turkey and to reveal phenotypic, genetic and environmental trends for the traits. Said Lincoln Barton, who practices equine dentistry, "Historically, the Friesian breed dates to warhorses from the Viking era. It is concluded that pens with wooden slats have positive effect on growth performance and behavioural characteristics of Holstein Friesian calves. 4% prevalence in Friesian cattle, while 19% prevalence for Babesia was recorded in both breeds during all seasons. Plains Exploration & Production Company (NYSE:PXP), a US-based company that explores for oil and gas resources in US, has announced a confirmation well at the Friesian Project in the Deepwater of the Gulf of Mexico. This might look like a cross between a guinea pig and Friesian cow but in fact it's my new puppy. A Friesian bullock is set to break records as Britain's tallest cow, his owners claimed. Life-sized sculptures of Friesian cattle are being sited on the grass-topped roof of the plush new Fort Dunlop development.